Now that the league tables have settled down a bit, it’s time for me to switch the weekly permutations graphics back on. Previously there were two graphics for each division: one showing how far it was mathematically possible for each team to move and another showing what my ratings model thought was likely. Towards the back end of last season I managed to successfully combine these into a single graphic, so that’s what I’ll be using from now on. 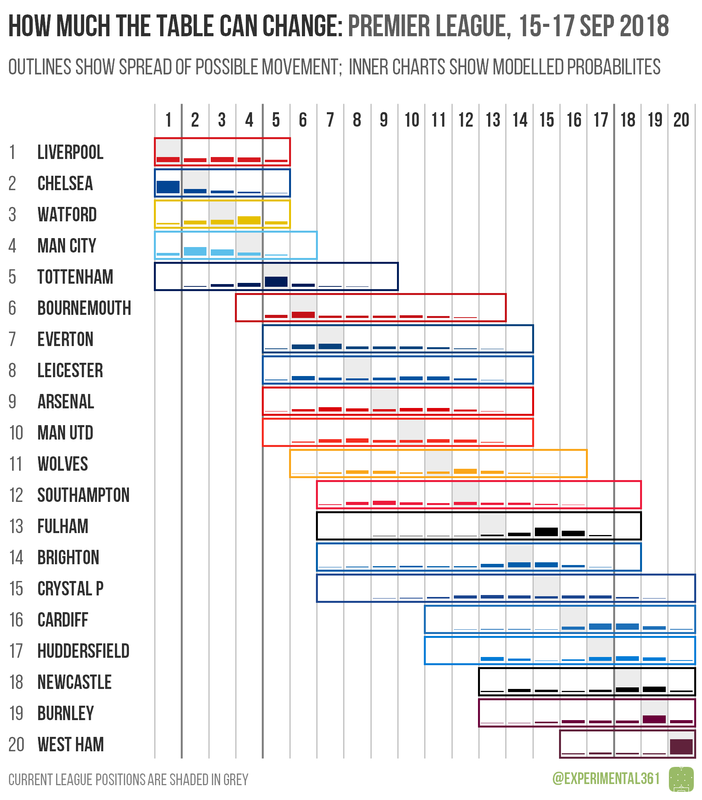 Each graphic shows the current league table on the left, a hollow colour-coded strip showing how far each team is mathematically capable of moving during the next round of fixtures and inside the strip is a little minimalist column chart showing the relative chance of them ending up in each position. With Liverpool having a tough game away at Tottenham, and Watford facing Man Utd, Chelsea have the best chance of going top this weekend at home to Cardiff. Nobody is guaranteed to finish the weekend in the top four, although Spurs are the only side likely to barge their way into it, and likewise there’s nobody doomed to occupy the bottom three at this stage. However it’ll probably take West Ham more than one game to claw their way out of the latter, given that they have a tough trip to Everton. 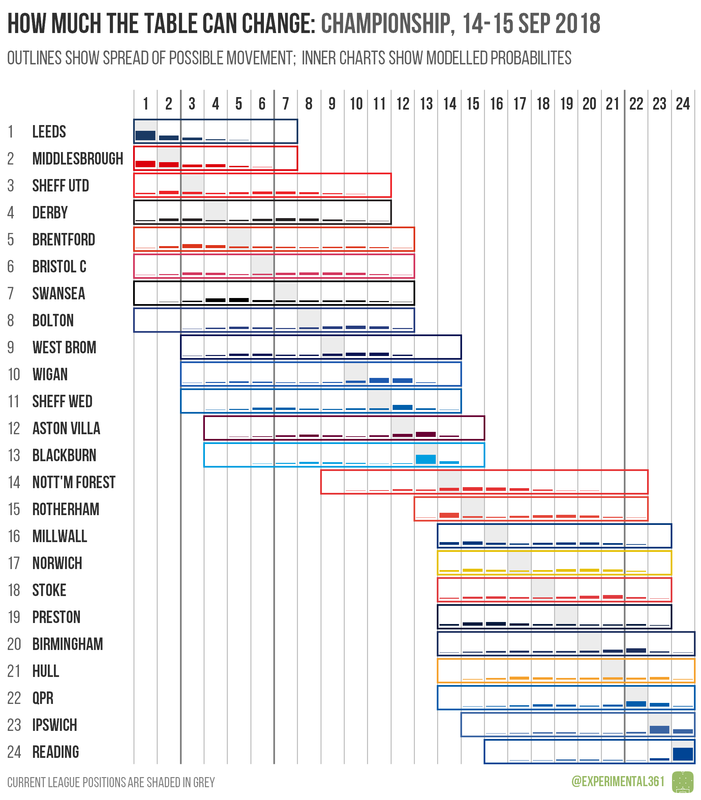 Every team in the division is capable of starting next week in either the top six or bottom three, with any one of the current top eight teams potentially reaching the summit (although for Bolton and Swansea in particular there’d need to be some pretty crazy results). There’s still plenty of fluidity in the bottom half of the table too where anyone from Forest downwards could find themselves in the relegation zone, although with Reading away at Preston they’ll do well to even move off the foot of the table. Peterborough’s fast start means that they’re guaranteed to remain in the automatic promotion places for at least another week regardless of what happens when nearest challengers Portsmouth come to visit. Just like in the division above, every team is capable of ending up in either promotion or relegation contention after this weekend’s fixtures, although the combination of results that would send the likes of Luton or Coventry down to 21st is incredibly unlikely. 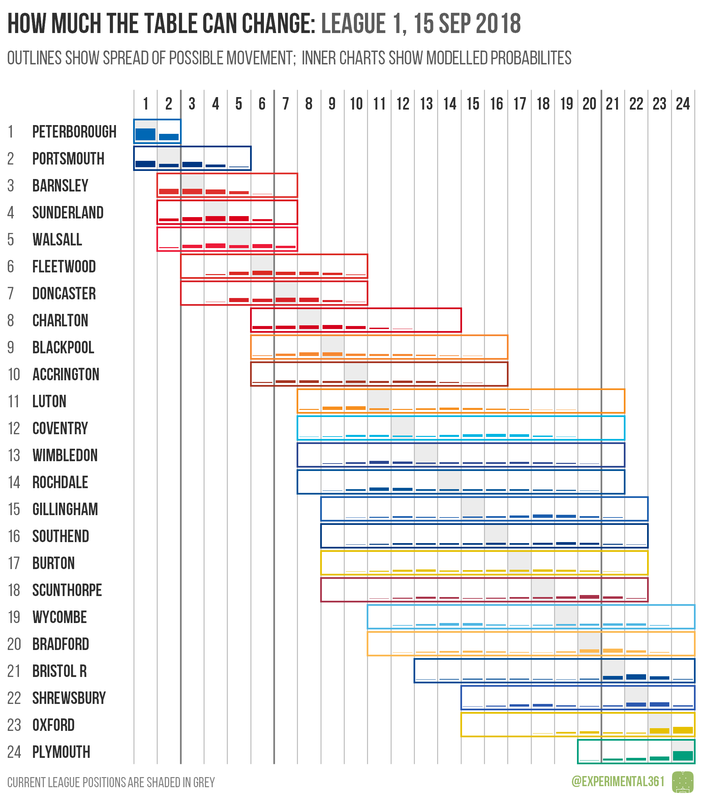 With Plymouth at home and Oxford away, the Pilgrims have a decent chance of moving upwards, but escaping the drop zone altogether this weekend is a big ask. It’s another wide open start in League 2, where every team down to 15th-placed Crawley is mathematically capable of sitting in an automatic promotion place on Saturday evening. 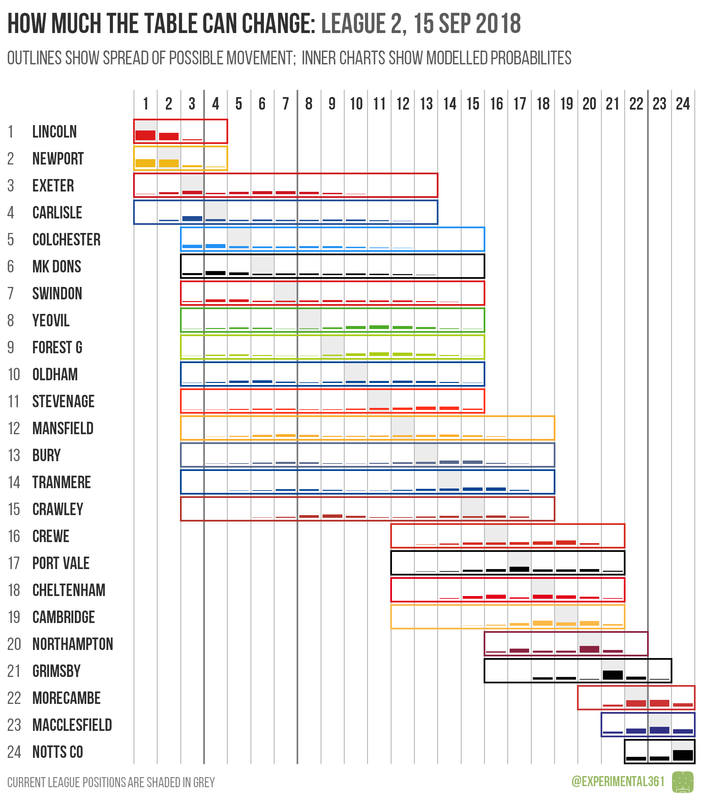 For Exeter or Carlisle to displace Lincoln at the top of the table, both the Imps and Newport would need to lose, with Carlisle’s goal difference relative to the current leaders counting pretty heavily against them in that scenario. At the other end it looks likely that two of the current bottom three will start next week in the relegation places, with Grimsby likely needing just a point at home to Oldham to stay clear for the time being.